Facebook isn’t listed on the NYSE or NASDAQ. But you can find the company on Sharespost, a secondary market for private companies where stock grants are actively traded. The idea is intriguing. Current and former employees are loaded with shares that may be worth something someday. But until then, they’re left with few options to liquidate their shares. Sharespost is the answer. Sharespost is like a Craigslist for stock in private firms. You can post an offer to buy shares at a price, or post your shares to sell. Sharespost facilitates the trade. Tesla was one of the companies listed on Sharespost before it went public at the end of June. Back in February, someone bought shares of Tesla for $9 per share. Since the company went public, you can get shares more easily on NASDAQ, but it will cost you $22 per share. The bold trader from February doubled up in 4 months. If you want to buy a share of Facebook today, there are plenty available at $75 per share. But that’s an implied valuation of $33 B. Facebook’s last round of fundraising pegged the value at $10 B, so it’s quite a premium. 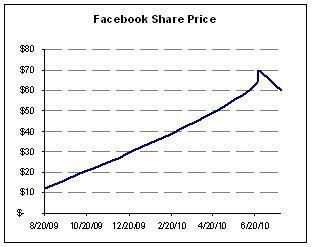 However, as Facebook’s valuation has been trending, it might be the perfect time to buy.